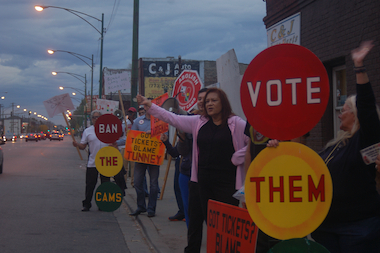 Two dozen motorists protested a controversial a speed camera at Archer Avenue Thursday evening. MCKINLEY PARK — A group of protesters gathered Thursday evening near a contentious speed camera on Archer Avenue, asking passing motorists to honk if they oppose the cameras. "Tax LaSalle Street, not our street. Take out the cameras, don't take the food off our tables," chanted the two dozen protestors who gathered at Archer Avenue and Paulina Street. The city has installed about 150 cameras at some 70 locations as part of a citywide program to curb speeding outside parks and schools. The Archer Avenue camera has been particularly controversial, in part because of its location a couple blocks away from a park. In fact, Ald. George Cardenas (12th) went as far as to say the city should close Mulberry Playlot Park in an effort to kill the controversial Archer Avenue camera. "I think that makes a lot more sense to me than having a playlot nobody uses and nobody can find," he said. Bill Drew, a member of the McKinley Park Progressive Alliance, said Cardenas is taking the wrong approach. "That's a typical political move," Drew said. "Instead of just taking away the cameras they want to also take away our green space." "These cameras are just hidden tax by the city and the mayor. They are nickeling-and-diming us," Drew said. Mark Wallace is chairman of the Citizens to Abolish Red Light Cameras, which organized the protest. "We want to expose the fact that this is a tax scheme. We want the mayor and City Council know that this is not a way to treat their constituents," Wallace said.